A team of international researchers, led by astrophysicists from the University of Exeter, Columbia University and NASA Goddard Institute for Space Studies, used state-of-the-art modelling techniques to extensively study the atmosphere of a ‘hot Jupiter’ found 150 light years from Earth. The scientists adapted the state-of-the art computer model used by the Met Office to study the Earth’s atmosphere to perform simulations of these exotic distant worlds that are the size of Jupiter, but orbiting more closely to their parent star than Mercury does to the Sun. The results were compared to observations carried out using the powerful Spitzer Space Telescope, probing our understanding of the conditions within the atmospheres of these planets. 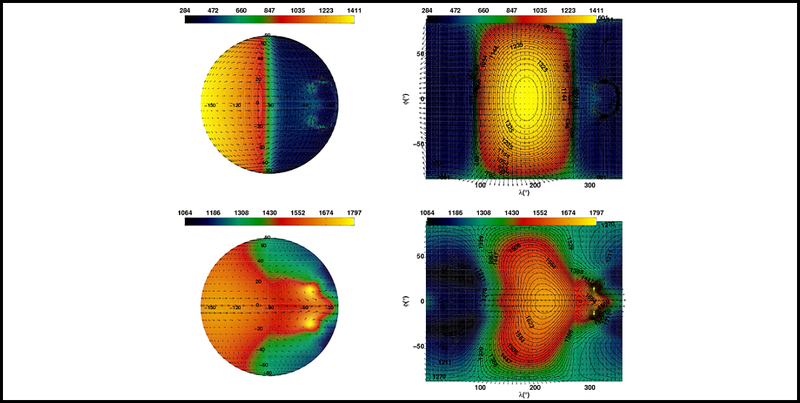 The research revealed results that were largely consistent with existing observations, most notably around the effect of heat transport in the upper atmospheres of the exoplanets where extreme velocity winds carry heat so rapidly that the hottest part of the atmosphere is shifted away from the closest point to the star, where it would be expected to be. However, the study also revealed some intriguing discrepancies, including significant differences between the observed and expected brightness of the hot Jupiter’s 'nightside’ - or the hemisphere facing away from the star. The team are now calling on further studies to be conducted to unlock the secrets of how these planets evolve in such close proximity to their host. The research is published in the respected scientific journal Astronomy and Astrophysics and is available online. Dr Nathan Mayne, Senior Lecturer in Astrophysics at the University of Exeter and one of the authors of the study said: “This research is not only important in developing our understanding of this exotic class of planets, but also represents the first steps to building a deeper understanding of how planetary atmospheres and climates work across a range of conditions, including those more conducive to life. The Met Office weather and climate prediction model is one of the most advanced models of its kind. However, this research applies this model to a planet with conditions far from that present on Earth, with temperatures exceeding one thousand degrees and an atmosphere spanning pressures orders of magnitude larger. A key finding of this research indicates that there is still no clear understanding of how the material that is moving from the hot dayside of the planet onto the cold nightside both cools and alters its chemical composition. Additionally, the team found intriguing hints that the deeper atmosphere, inaccessible to observations, supports large-scale, slow moving circulations potentially altering the temperature structure deep in the hot Jupiter’s atmosphere. 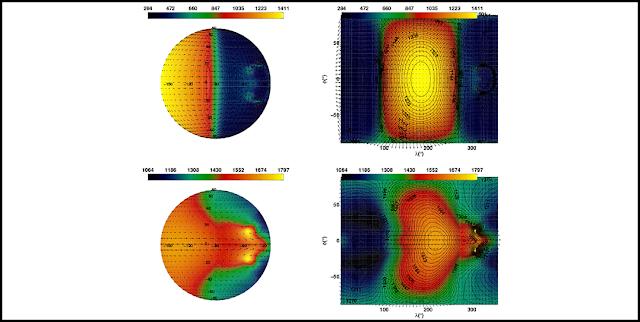 "The UK Met Office GCM with a sophisticated radiation scheme applied to the the Jupiter HD209458" is published in Astronomy & Astrophysics and is available online. It seems to me that hot Jupiters have to be transitioning to something else. I can't imagine how a large mass orbiting that close to a star could last into the millions of years, maybe less, without being torn apart by combined thermal and tidal forces.